It's just over a year since the 'back-to-back' Knitting Night on NRK2, which saw Guri the sheep have the wool off its back shorn and made into a jumper for a human back. Nasjonal Strikkeveld was part of a world record attempt; sadly that failed - but the knitters knitted on to set a Norwegian record - and engaged several hundred thousand viewers as part of this Norwegian Slow TV (which has become known as Sakte TV in Norway). 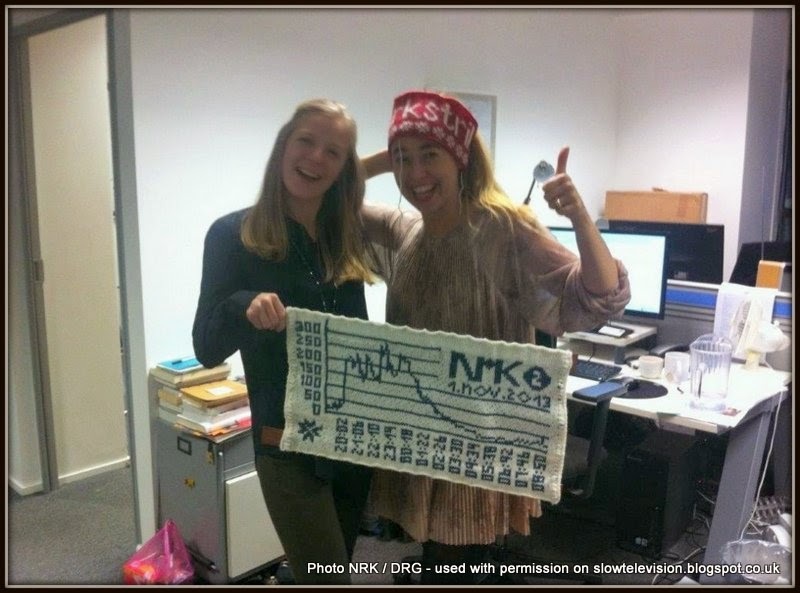 The photo here (courtesy of NRK / DRG) and used with permission, shows the knitted statistics for the show. Figures in hundreds of thousands are on the vertical axis, with pertinent points in the transmission along the horizontal axis.